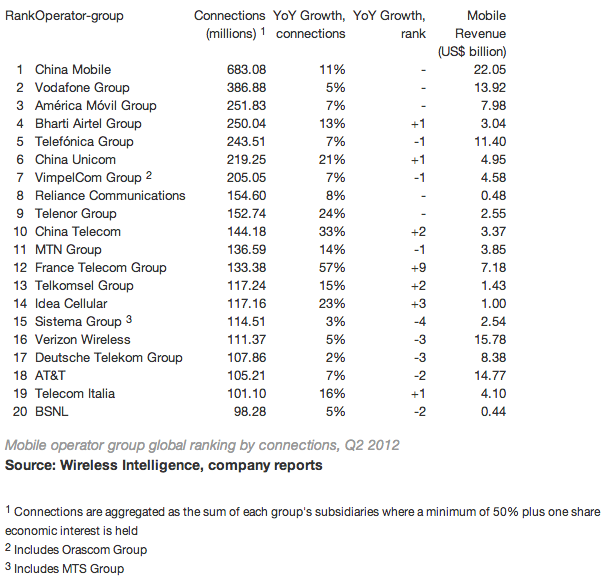 Wireless Intelligence has compiled its annual ranking of global carriers by number of mobile connections, and not much has changed from last year’s list. China Mobile(s chl) still dominates the list with nearly 700 million subscribers, and the composition of the remaining 19 is roughly the same, according to the analysis arm of the GSM Association. If there is an underlying trend visible, though, it’s that Asian operators are gradually displacing normally dominant Western operators. Vodafone(s vod) and Latin America’s America Móvil (s amx) kept second and third rankings, but India’s Bharti Airtel replaced Telefónica(s tef) at No. 4, and it’s within spitting distanced of breaking into the top 3. Asian operators China Unicom(s chu), China Telecom(s cha), Indonesia’s Telkomsel and India’s Idea Cellular all rose in the rankings. Meanwhile, Verizon Wireless(s vz), AT&T(s t), T-Mobile-owner Deutsche Telekom, and Russia’s VimpelCom(s vip) and Sistema groups all fell in the chart. Every single one of these carriers saw its customer base grow, but in general Asian operators saw much faster growth. That makes sense since many Asian countries are still far from reaching the mobile saturation levels of the west. The big exception was France Telecom(s fte), which fell off the list completely last year but returned in the No. 12 slot. Though on paper FT’s total global subscribers by 57 percent, that performance has more to do with Wireless Intelligence’s methodology than any spectacular performance by FT’s Orange properties. WI only counts connections if a carrier group owns a majority stake in an operator (for instance Verizon’s subscribers don’t count toward Vodafone’s total). FT recently upped its ownership in several operators over 50 percent, which accounts for the huge subscriber boost. It’s also important to note that connections don’t always translates into revenues. Verizon and AT&T rank 16th and 18th in total connections respectively, but they’re Nos. 2 and 3 in total revenues. In terms of revenues, Verizon is larger than its parent Vodafone, even though Vodafone has more than three times as many customers. As Wireless Intelligence points out, North American operators have a particular knack for making more money on each connection. What about TeliaSonera? As long as i know they can count in total about 150milions subscribers.. I imagine the difference in ARPU is america’s love of subscription services. The world over seems to have embraced pay-as-you-go, which lowers revenues but gains subscribers. Oddly, I noticed that America Movil on one of the biggest pay-as-you-go providers in the US, operating under Net10, Tracphone, and others. Hi Steven, yep. But I think the connections are actually being counted to the network operator which in this case would be AT&T, T-Mobile and Sprint and if I’m not mistaken. A knack indeed. Based on these numbers their APRU is ~2X the nearest competitor (Deutsche Telecom), and ~3X the next closest one (France Telecom). Unfortunately I think this has more to do with the ability of American telecoms to manipulate regulators rather than any superior business model or strategy for achieving higher revenues. I think that’s part of it, but I also think consumers are just as responsible (or have different priorities). There are plenty of cheaper alternatives out there, but consumers still gravitate to toward VZ and AT&T. In particular Verizon is known for having good service and coverage, and apparently a lot of people think its worth paying a steep premium for.